​Your business deserves the best security for yourself and your customers, and Plano Roofing Experts is here to assist. Commercial roofing, also commonly referred to as flat roofing, often provides more longevity that residential roofs and this may be due in part to the high quality material reserved for such spaces. 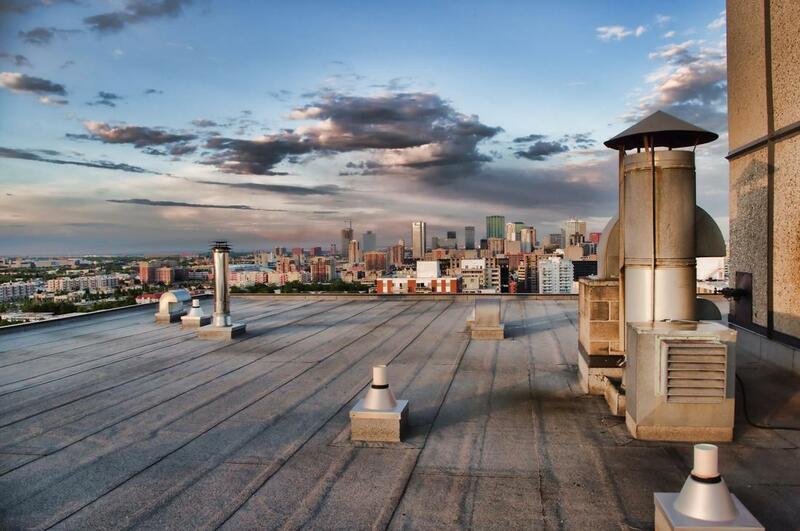 Commercial roofs, with their use of metals such as copper and zinc, can often guarantee businesses a roofing life expectancy that lasts over 30 years. No business owner can afford to have cheap materials hovering above his or her company. With many businesses operating expensive technology within their walls, it is best to properly invest in the security of your building and all of your business investments. When working on the roofing of commercial spaces, we investigate any potential hindrance to the durability of your roof. Rooftop debris can play a significant role in roofing issues. Unexpected items can become stuck in gutters or interfere with proper water drainage so we make sure that we clean all unwarranted items from the roofing areas first. Not only does debris impact gutters, but it can clog roof drains and cause an overflow of water to sit atop your commercial space. This can create long-term damage especially if the roofing membrane is not secure. Additionally, some roof tops can accommodate people. The rooftop cannot be an inviting space if it is flooded with water and overwhelmed with trash. We clean your rooftop space and allow it to have the visual appeal and secure foundation to charm all visitors. Open Field Seams are also a major issue with maintaining a solid roof. If the seams are not safely secured, water damage can become a result. We have the best adhesives and tapes to secure your roofing material and resist water damage. Who wants roofing material that can be easily maneuvered or lifted? It simply isn’t safe, and our team of experts are prepared to use our advanced technology to secure those seams or replace the material in its entirety at a price that cannot be beaten. If your business has not been investigated in some years, it is worthwhile to contact us to investigate whether open seams exist. This is a common problem that can cause long-term damage. We serve a broad range of businesses and offer a variety of installation options. We consider the long term viability of our roofs as well as their environmental impact. We want our roofs to not only get the job done and look pleasing but to fully represent your ethics. With our warranties, specialized training, and safety programs, we ensure that you have the best quality roofing contractors working on your roof.